Larissa has won a well- deserved notice from my blogfather Michael Blowhard. I (ahem) predicted to Mattew and Reid that Michael would find, and be entranced by, Larissa’s blog. In other blogfamily developments, Peculiar has posted more pictures of his wedding at Odious and Peculiar, as well as a lot of other good stuff. But I found the knitted intestines separately! There’s a joke among my friends, persistent but no longer very funny after fifteen years, that I’ll eat in only one New Orleans restaurant. It’s not true—I’ll eat anywhere, especially in New Orleans. But if you know The Pizza Kitchen, the one in the Quarter between the old federal mint and the French Market, you might believe it. Is it the food? Yes and no. The food is good: wood-oven baked, thin crust gourmet pizzas; an award-winning Caesar salad; surprising pasta dishes; all with a generous dollop of local ingredients, like andouille sausage and crawfish (and even once, briefly, nutra-rat!) The menu is wide and diverse, and most entrees slide in under $11.00 in a town where it’s possible to pay any price for a plate of food. But for all that, LPK is a local franchise. We have one here in Baton Rouge, and there are several in New Orleans. I’ve sampled a number of locations and found them consistently good. What makes the French Quarter location special is, well, the French Quarter. Well-settled into it’s corner spot, this one always seems wide open and inviting. Tall, shuttered windows let light and air flow on pleasant afternoons (there are many, but none in summer), and from the short line that forms after 8PM, one can see past diners to the vendors of the French Market packing up their baubles. Despite proximity to busy tourist paths, the clientele most nights is a local mix. Families with small children feel welcome as do drag queens, musicians, service industry employees and sometimes falconers. My friend Jenn kicks her husband’s shins whenever he comments on the local color, which he always does and always with deep appreciation. Another old joke between us: We are all about equally strange. So what prompts this note? Reid spotted this story by LA Times staff writer Thomas S. Mulligan. I knew my favorite New Orleans eatery had reopened, but I was pleased to see someone else noticed. I hope this doesn’t mean I’ll have to wait now for a table! This New York Times science story on a spider taxonomist is of particular interest because it does a good job explaining the matter of cladistics. Hoew do we know who is related to whom? “This congruence of characteristics unites spiders uniquely from all others, he said. Apply the concept with higher degrees of specificity, and species’ characteristics emerge. It is now accepted that, unlike what was previously thought, cladistics can actually demonstrate both relationships and their degrees of closeness. Another in the continuing series. “I think that a lot of people are carrying around in their heads, unarticulated and even in some cases unnoticed, a sense that the wheels are coming off the trolley and the trolley off the tracks. That in some deep and fundamental way things have broken down and can’t be fixed, or won’t be fixed any time soon. That our pollsters are preoccupied with “right track” and “wrong track” but missing the number of people who think the answer to “How are things going in America?” is “Off the tracks and hurtling forward, toward an unknown destination…..
“It’s beyond, “The president is overwhelmed.” The presidency is overwhelmed. The whole government is. And people sense when an institution is overwhelmed. Citizens know. If we had a major terrorist event tomorrow half the country–more than half–would not trust the federal government to do what it has to do, would not trust it to tell the truth, would not trust it, period…. Much more there. From WSJ. Ever since reading Michael Pollans’s wonderful The Botany of Desire I have been fascinated by Kazakhstan’s wild apple groves, the “Eden of Apples”. There might have been, at least until recently, more genetic diversity in a Kazakh grove than in all of North America. You can also see a grove, and other good stuff here, at Virtual Almaty, though the (I think) ethnic Russian author thinks that Russians brought apples there. Not true! Though it was a Russian scientist named Nikolai Vavilov who discovered in 1929 that the Almaty area was “Apple Eden”. (He was later eliminated by Stalin for not following the Lysenkoist party line on genetics). Jeff “Skunk” Baxter, the brilliant guitarist who gave the pre-jazz version of Steely Dan (still in all incarnations my favorite Seventies band) its edge, is now a sought- after analyst on terrorism and defense. And he is self- taught! ” “My journalist friend laughs at the suggestion that Putin has suppressed all independent political thought. He should know; he has twice been sacked from newspapers for writing pro-Putin articles. The problem, he tells me, is that Westerners listen too much to the likes of the former oligarch Boris Berezovsky. Incidentally, he adds, Berezovsky still owns a newspaper in Russia — so much for there being no anti-Putin voices. In fact, my friend suggests, there may even be more freedom of expression in Russia than in the West, because there are fewer social and legal constraints on ‘politically incorrect’ and extremist points of view. If you want to be racist, sexist or anything else-ist, you’ll find it easier to get a publisher in Moscow than in London or New York”. A knitted, anatomically detailed, digestive system. The swordfish (Xiphias gladius) occupied a prominent role in the religion of the prehistoric Chumash, a coastal and island people of Southern California. I have posted about the Chumash before here a few times. Living near the Pacific as they did, the Chumash believed that the ocean and the land were complementary worlds and that each had corresponding equivalent plants and animals. For example, they believed that sardines were the “lizards” of the ocean, and that lobsters were the “jerusalem crickets” of the ocean. Swordfish were given the ultimate accolade of being the “humans” of the ocean. This didn’t keep the Chumash from fishing for them, but they were seen as possessing great power. 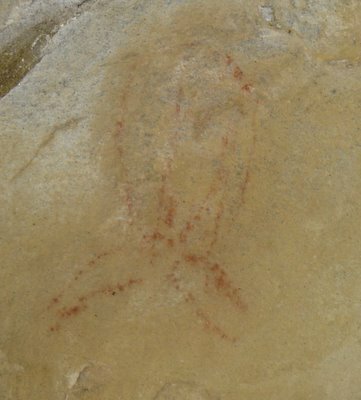 Historic and ethnographic accounts tell us that a swordfish dancer played a prominent role in a number of Chumash ceremonies. 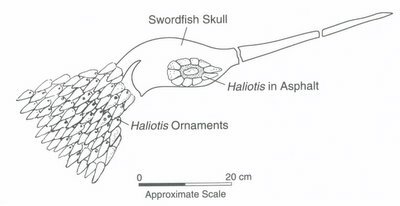 The swordfish head-dress pictured above, was found by archaeologist David Banks Rogers in 1926 in a site at Winchester Canyon, about three miles west of where I sit writing this. This was found in a burial: a male buried in fetal position lying on his left side was wearing this on his head. The swordfish eye was rendered as was a cape with iridescent Haliotis (abalone) shell plaques. This was obviously the sort of head-dress worn by those dancers. One of the powers of the swordfish, and one of the reasons that the Chumash venerated them was that they were believed to drive whales ashore. The beached whales provided the Chumash with lots of food. Whales (and beached whales!) are fairly common here as both gray and humpback whales migrate through the area near shore. 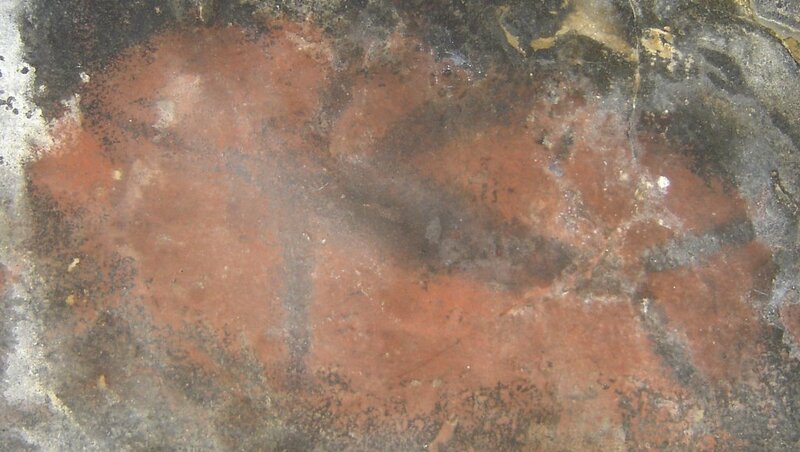 Swordfish also appear in Chumash rock art. The example below comes from Swordfish Cave, a rock shelter at Vandenberg Air Force Base, that Connie and I visited last May. This pictograph is hard for some people to pick out in a photograph. It is a black fish on a red background – the tail is to the right and the fish’s bill is to the left. On the same rock face, about four feet below the painting of the swordfish, appropriately enough is this pictograph of a whale. I will leave you with question that many have asked and that no one quite knows how to answer. 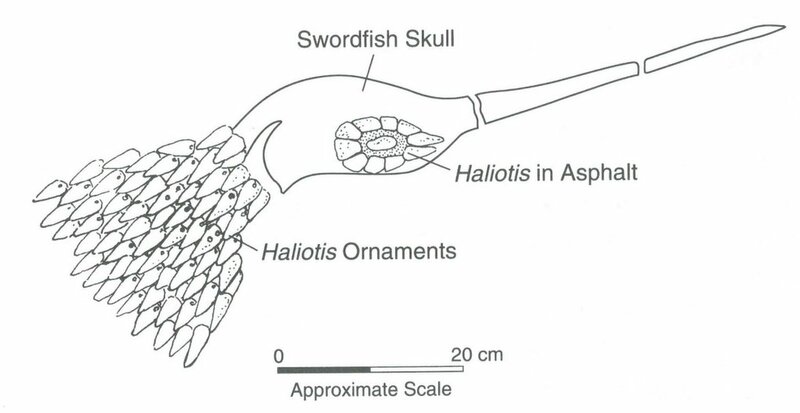 Look closely at the pictograph of the swordfish. The dorsal fin is at the bottom of the image. Why is the swordfish upside down?